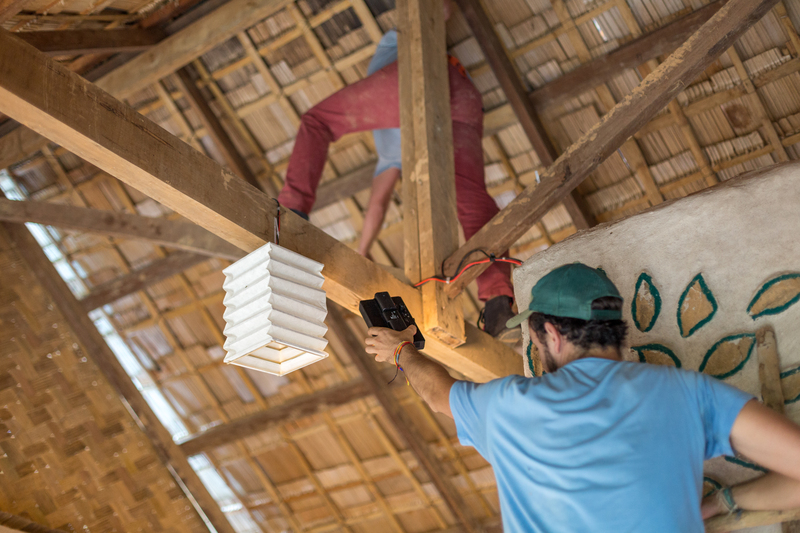 This Friday, we finally could work for the project that originally motivated us to go to Laos. 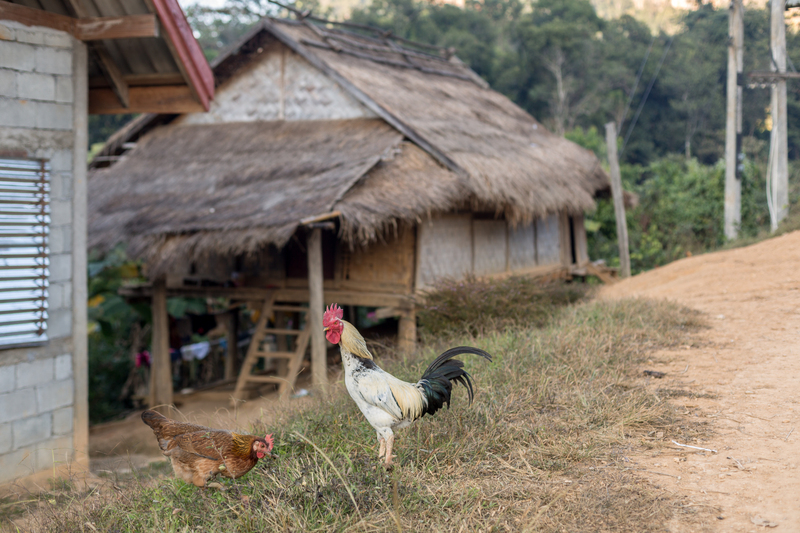 Those of you who read our first blog post on why we are in Laos now might remember it. The project “Fair Trek” has been too busy with their regular student groups to offer us to work with them. After we arrived in Laos, we were told that around end of November, things might get better. 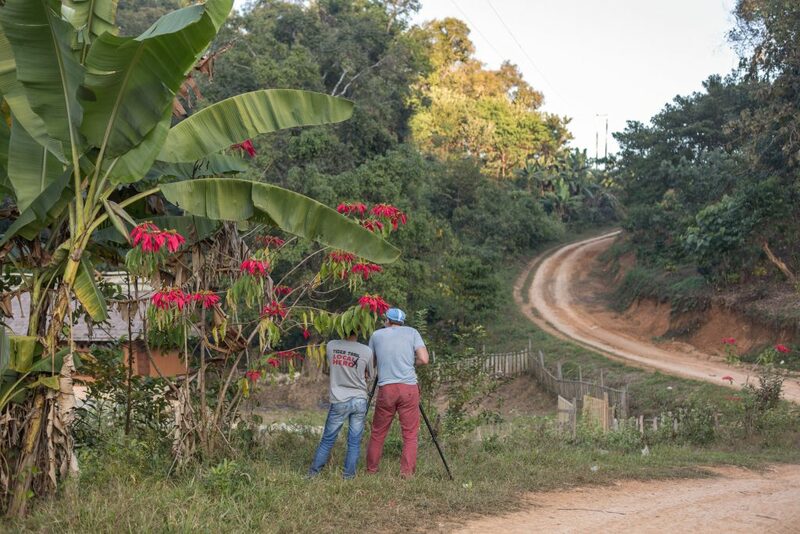 It took a bit more time, but recently we joined the current supervisors of the project on a tour to a village. Many of the countries in South East Asia benefit from tourism, some are quite dependent that tourists spend some money in local shops and guesthouses. Laos makes no exception. Still, there’s a risk that most of the money goes to some hotel owners, while most the population does not profit from it directly. That’s where Fair Trek tries to change something. The project consists basically of building bungalows and infrastructure in villages and teach the villagers on how to make tourist feel comfortable. That makes it a solution where everyone benefits. On the one side, we have, of course, the villagers. In the beginning, Fair Trek and the village together manage the bungalow. But after some time, the future of tourism will be left completely in the hands of the community there. That allows them to make decisions on their own and control the number of tourists in their village while getting some income from tourism. On the other side, the tourists benefit as well, as they can experience real Lao life and culture. They’ll get to see more than the tourist hotspots and learn how people live in the middle of nowhere, one and a half hours away from a town. It’s an amazing experience and I can recommend you to try this if you want to visit Laos. If you want to learn more on Fair Trek’s aims, their programs, and their work, visit their webpage. I can especially recommend their video on the project and the first Eco Bungalow here. Our job for this day was to prepare the so called “Eco Bungalow”. Photos had to be made and there were some last steps to finish it. That included to paint some walls, sand door frames, clean everything, bring some furniture and decoration and make everything look nice. 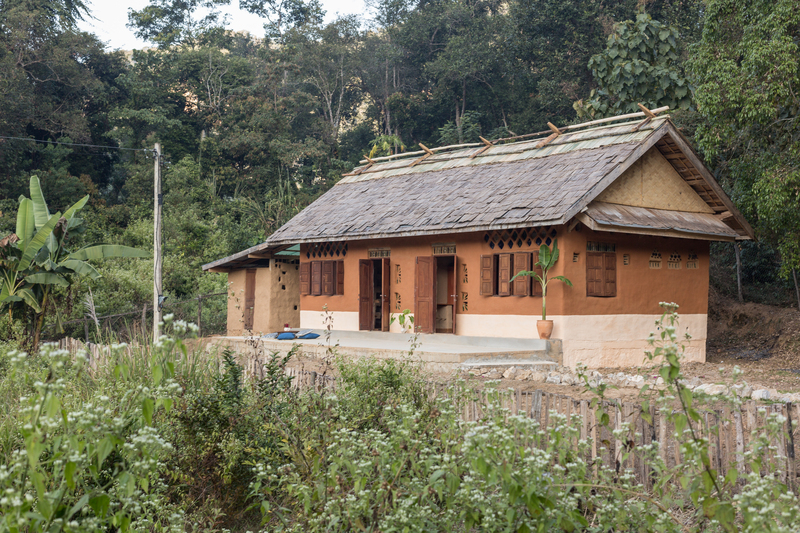 It’s the second bungalow of Fair Trek, consisting of two double bed rooms and a small hut for guides next to it. 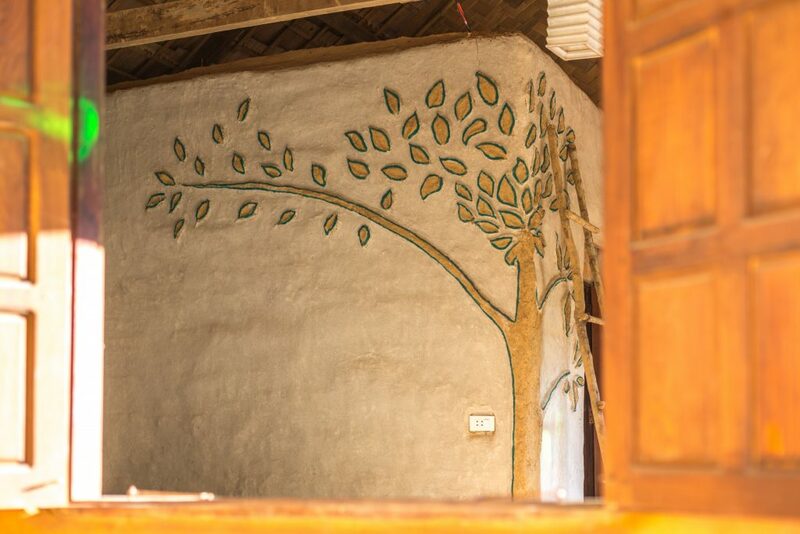 The building is mostly made from clay and wood as well as recycled materials such as old bottles. Early in the morning, we loaded a tuk tuk full of decoration, some small tables, mattresses, pillows, and more stuff. We squeezed us onto it (we were nine people in total) and took a bumpy ride to Nong Khuay village. Juliana and Gregorio, the current Program Managers of Fair Trek, Khamchaen, the Operations Manager, an American photographer, two girls, and a driver took us with them this day. We first started getting some tools from the village and cutting some flowers and bushes for decoration. Well, the sun roasted most of them until the photo session in the late afternoon but it’s been too late anyway. 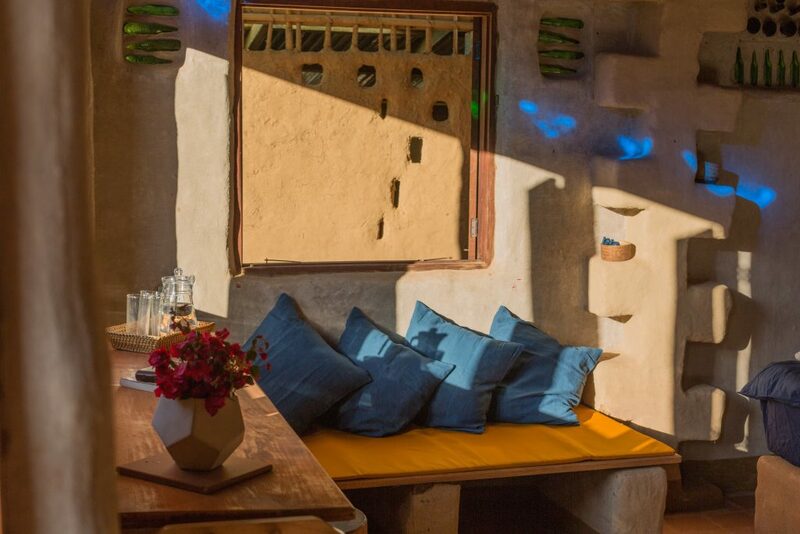 We prepared one bungalow for the photos by making the bed, placing some more furniture and lamps and decoration it with flowers, books, and local handcrafted products. Additionally, we equipped the bathrooms and did some more crafty work to finish the construction. In between, we enjoyed delicious lunch cooked by a local family. Everybody was friendly and interested and I think at least some look forward to welcoming tourists in their village. Finally, after the bungalow was captured (even a 360° camera has been used), the sun had set already, so we packed our things and headed home. To conclude, we really enjoyed this day , thanks Juliana and Gregorio for this opportunity. I hope that we can help the Fair trek team many more times in the future.